I've been wanting to do a blog post about tattoos for a while now, but wasn't sure of the right place to put it. The main place I blog (semi-privately) My Life Without Jack - is an invited readers only blog, but this is kind of my defunct fashion blog - though I'd like to get it up and running again soon. Anyhow, I decided to dump it here. And then, years later, all it took was one person saying "Is that an M for Martin?" (My now husband's name) and I was like ughhhh. Because more than one person would say that. 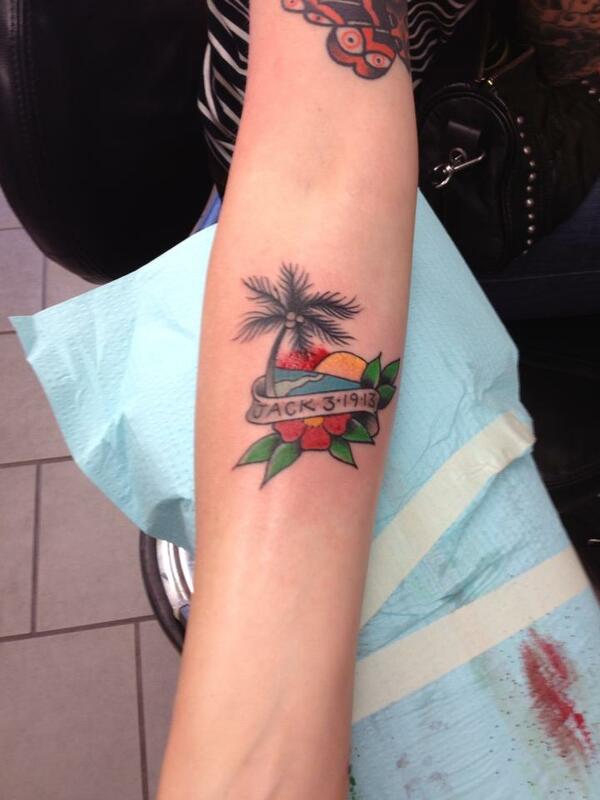 Looking at this photo now, it seems kind of sweet and innocent, such a first tattoo. In a way I wish i'd been able to keep it, if it were on my leg or something I probably would have. After I got married in 2010, when I was 31, I got the "M" covered up with a beautiful 1/4 sleeve tree, whose leaves turn into birds that fly away down my back. 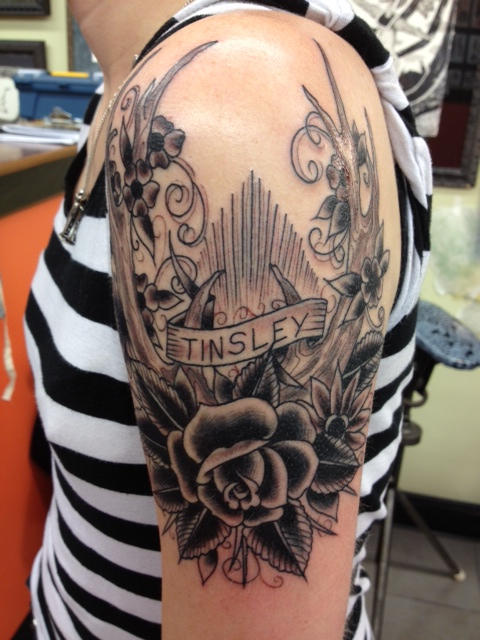 This was done by Brian Massey at Lucky Monkey Tattoo. The tree was based on a combination of the tree in our front yard of our first home and the background the forest in my family's place up north. I am now in my 30's and my body, both physically and mentally is much more "lived in" I now have a good story to tell my daughter. 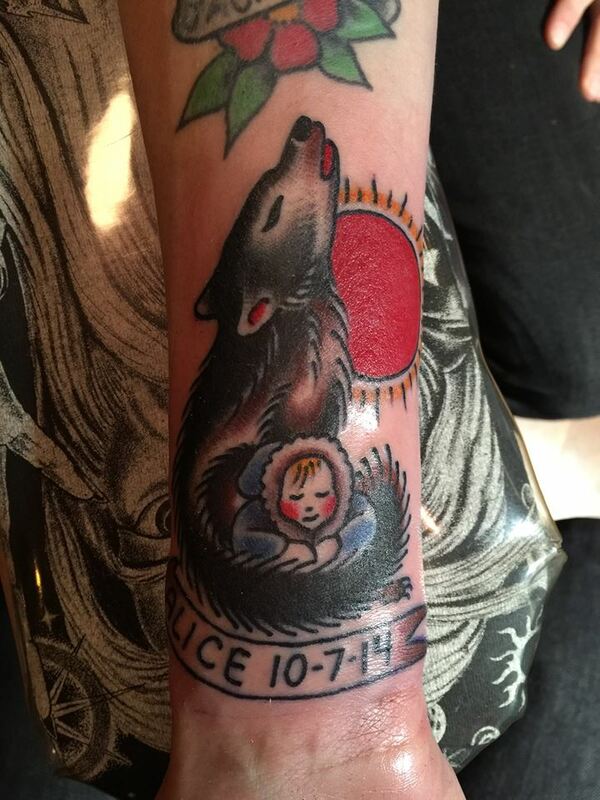 People often say to me, well what are you going to say to Alice when she wants a tattoo?" and I tell them, well, I'm going to tell her I got my first tattoo at 21, and then covered that up when I was 31. And all the rest of my tattoos I got in my 30's. If Alice wants to get tattoos in her 30's, I can't say that would bother me at all. 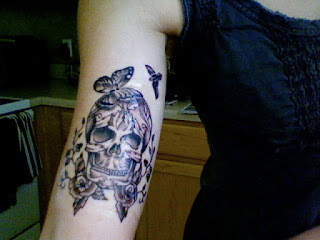 If she gets a tattoo when she's 21, that's okay too, but I won't hesitate to tell her to really think deeply about it. When they say tattoos are addicting, it really is true. 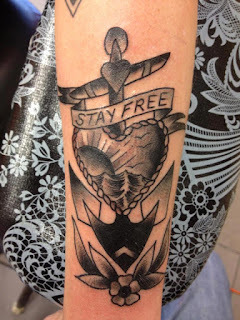 The next tattoo I got, was after hearing that a new shop was opening up in Ferndale, and to celebrate the occasion they were doing $20 tattoos. 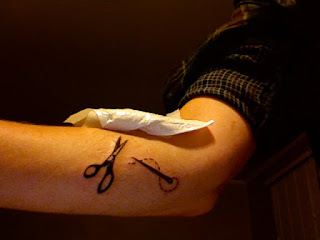 I went with some friends and got this cool needle and scissors tattoo. Since I had recently graduated from fashion design school, it was perfect. Dan Rick at Signature Tattoo did this one. Getting something in such a visible place such as the forearm was when things really started to change for me. I started to realize how freeing it felt to make significant choices about the way I wanted my body to look. 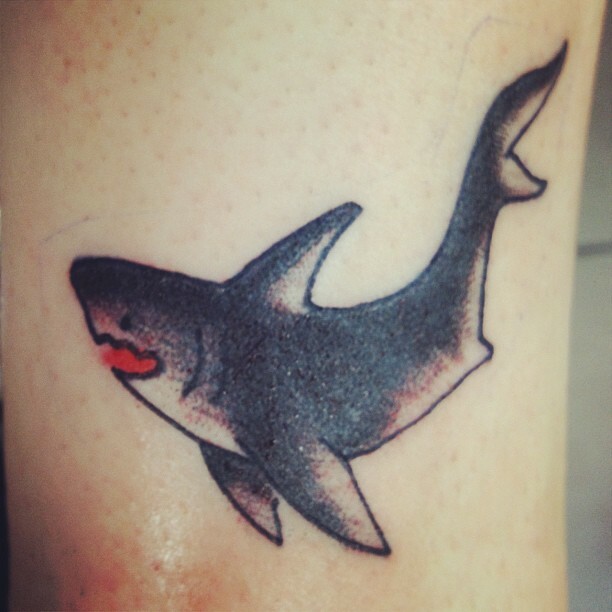 My husband, who has no tattoos, was surprisingly very supportive of me. I still to this day, am so grateful for that. Some time after this, Alexander McQueen committed suicide. He is the designer who has most influenced my work, and motivated me to go back to school for fashion design. It was heart wrenching to hear the news, and I wanted to get a piece that would honor him and his influence in my own art. I got this tattoo from Zera Anderson at Brite Idea tattoo, which was based on an Alexander McQueen drawing. By this point I was starting to feel really even more empowered by my growing collection of visible tattoos. What's more, is that for most of my life I had been tormenting myself with an inner dialogue that was not so nice. I could always find something wrong when I looked in the mirror. Your arms are too fat, your skin is too saggy in places, your nose is too big, you should be skinnier, fitter, etc. 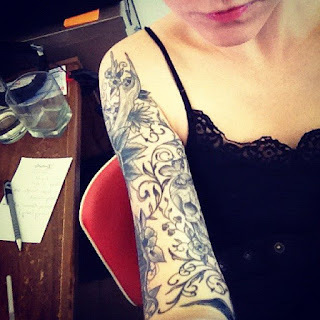 But I realized as I began to get more tattoos, I started to like myself "as is" much more. My body was becoming a canvas for beautiful things, and I was starting to actually like looking in the mirror. I no longer scanned my arms for the parts I thought were "fat" - instead, I scanned my arms with happiness. I was starting to feel like a person. Like the me I always wanted to be. 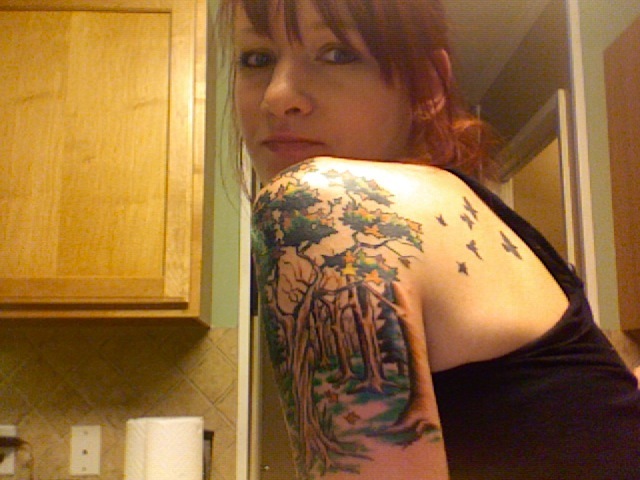 A couple years after this, I got this piece for my family, and this was also the beginning of my full sleeve. This was done by Davey James at Signature Tattoo in Ferndale. 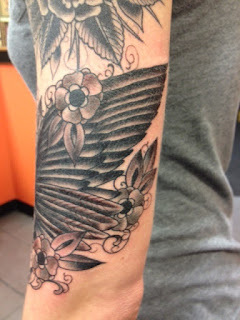 I decided I wanted to go for the full sleeve in black and gray, and continued to work with Davey on finishing this entire arm, which was done sometime in early 2012. I think the next part of it that I added was this bird wing for my grandmothers, who died in 1998 and 2009. Then, I got this anchor as a reminder - a sort of ode to the relationship that Martin and I have. :) And not free from each other - it's just the way we live life I guess, we are free spirits. We've always been a little crazy, kids at heart forever. We tied it all together with some vine-y filigree. It's really pretty. Sometime after the sleeve was done, I traveled to New York and got a tattoo of my best friend, my pug Suz, my first baby. It was a really fantastic experience being in the legendary NY Adorned, being tattoo'd by a famously talented female artist I have long admired, Virginia Elwood. Another time, also some time in 2012 I think, my friends and I got wolf pack friendship tattoos on our ribs of this wolf. I think it was then I decided my ribs are my very least favorite place to get tattoo'd. It felt like he was using a shard of broken glass on my rib bones. But it was worth it. 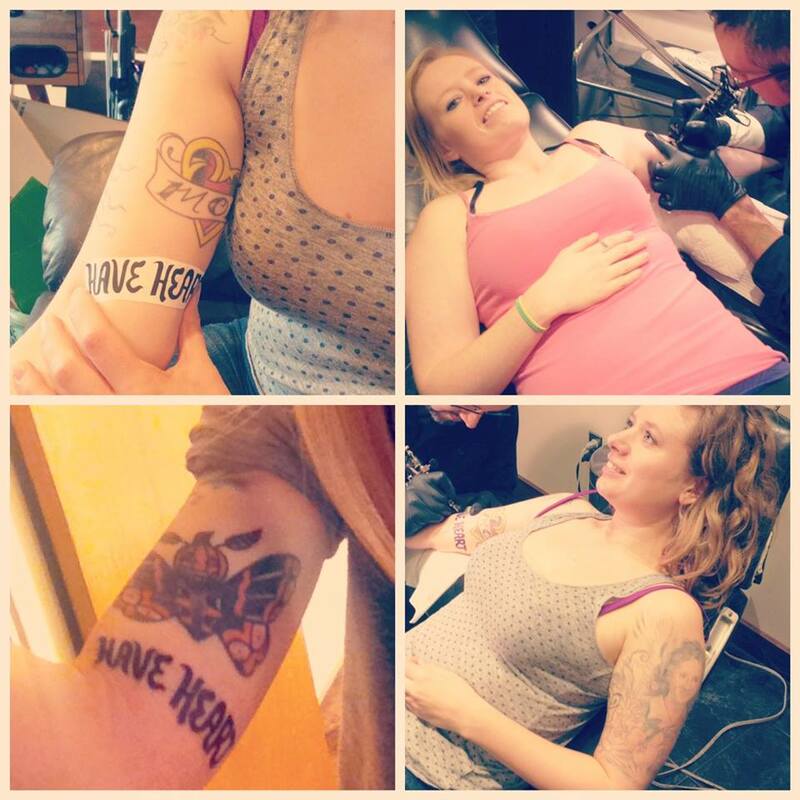 Spending all day in the tattoo shop with my best girl friends, laughing and joking for hours. I have to say it was one of my most favorite days. I will always look back on that time in my life with a smile. Another day not longer after that, I just stopped in the shop with my friend Amanda, and we wanted to get tattoos but weren't sure what. 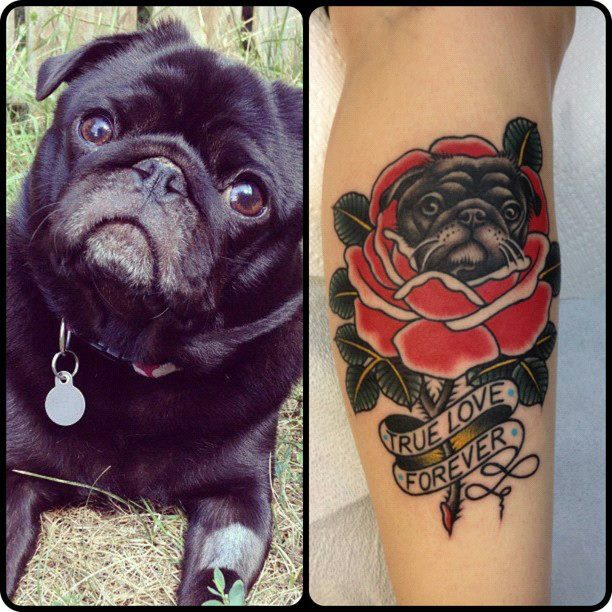 Davey showed me this image he had been working on with a single needle tattoo machine in mind for doing the design. I liked it so I decided to get it. At the time it felt right but I didn't know why. 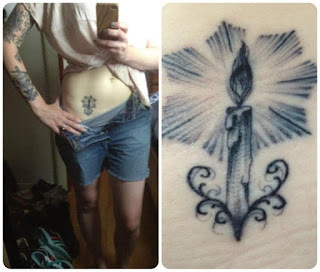 Years later this tattoo became so significant because of the placement on one side of my lower belly. I have had so much trouble with my reproductive system. I had three surgeries, I lost a child, and I nearly lost a second child... but somehow my body came through for me with Alice. I didn't give up on it, and it came through. It's funny that a tattoo I wasn't even sure what it meant to me when I got it, other than it was pretty, would later mean so much. 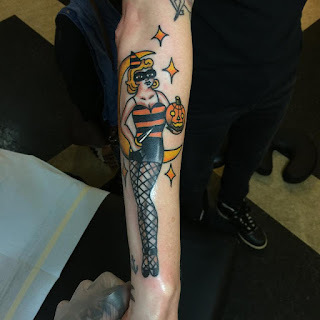 I love Halloween tattoos and since it's my favorite holiday I knew I needed something, but I wanted something unique. 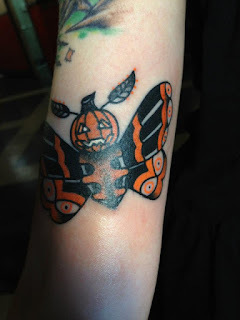 I came up with this Jack O Lantern Butterfly and went to see Jon Larson at Depot Town Tattoo on a day that I saw a Facebook post that he was taking walk-ins, and feeling excited about doing Halloween Tattoos. I think it was Devil's night actually! Devils night 2012. My two sisters and I also got matching tattoos. Mine was done by Chris Fox at Depot Town Tattoo, and theirs was done by Matt Hessler at XS in Rochester. We made the appt together with Matt but then I found out I was pregnant so I went with them to get theirs and then got mine later from Chris Fox since he was so much closer to where I live. Allison is a graphic designer who hand draws the most beautiful font lettering. She drew this and we all got it tattoo'd. What a cool experience to share with my sisters. It was really fun and I love this tattoo. Unfortunately my son Jack was born premature and did not survive. It was and still is the most devastating event in my entire life. It was hard to choose what kind of tattoo to get to honor him. I choose this idea because his last week alive with me was in Hawaii. This was a really emotional and intense tattoo to get. I had it done by Davey James at Signature. I choose Davey because he had done the most work on me so far, he knew my son had died, and it just felt right to have someone I felt comfortable with and whose work I admired so much. It turned out perfect. After Jack died, my husband and I spent a lot of time on the road. We went on so many road trips, most of which were traveling to see our favorite band, Lucero. I will say a huge part in our healing was due to these trips and their music. It really saved me to have this escape, and to have this new bond with my husband. We both really love their music and don't know anyone else really who is as into them as us. 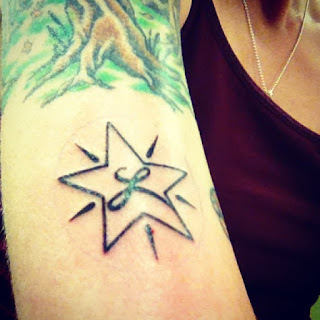 On one of the trips to see them in Memphis, I got this L-Star tattoo, which is a logo the band members all have and many of their fans have as well. Signature Tattoo continued to have more $20 tattoo parties on their anniversary each year, and I always love going. It's such a blast. I have gotten to know many of the artists there, and it's just so much fun. No, these don't have deep meaning, but I enjoy the memories, as I always have great stories from these parties and all of the art work is so incredible, I'm honored to wear these designs on my body. Sometimes a tattoo isn't always about the image itself, but more about the memory that image evokes that you can carry with you forever. For example this deer and spider, I will always remember - this party fell on my birthday. A particularly sad birthday in which (after many many months of trying with fertility treatments) I found out I was yet again, not pregnant. My best friend Kelly Jean and my sister Allison came up there with me, and we ended out having the best time. I will remember those tattoos as the day that what could have been the saddest birthday, was saved by my sister and my friends. Nick, the artist who did the deer, heard it was my birthday and got everyone in the shop to sing to me. It was amazing. I was so happy for that day that could have been so very sad. This year my sister came with me again, and she had recently lost a baby as well, her second baby no less. I was just happy to be spending time with her to help her think about other things. It reminded me of when we were younger and we used to hang out and do crazy things together. I said, I want to find a weird ghost.. and without hesitation she said, yeah i'll get the same one. 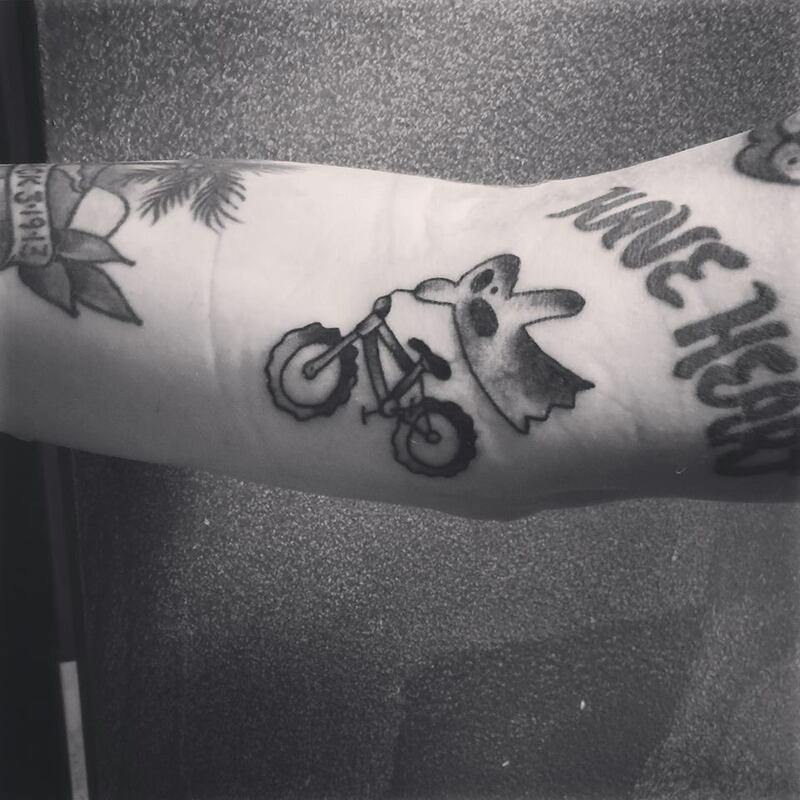 A ghost riding a bike? exactly what we were looking for. 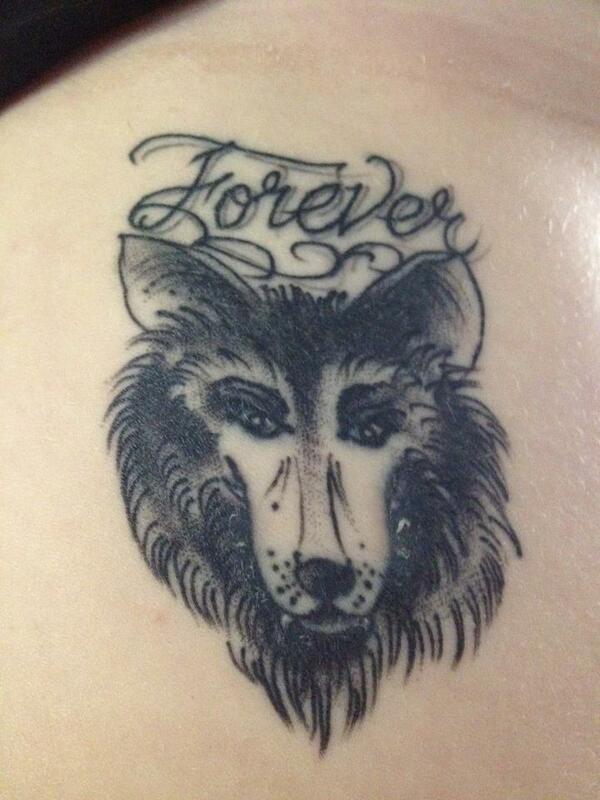 People probably think this tattoo is so silly, but I love it so much. It's just about me and my sister and the memories I have with her. It's important to me, these little things that other people don't have to understand. This was a design by Zack Hewitt and done by Davey James. 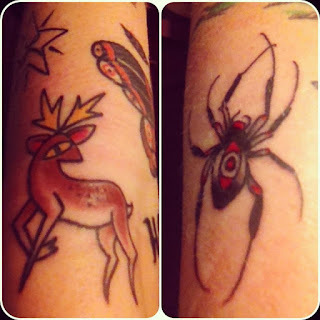 This last and most recent tattoo, I had been thinking about a lot over the years. Halloween has always been one of my biggest loves and a huge part of my life ever since I was a little kid. I wanted a way to tie that in, as well as an inspiration from Theatre Bizarre, since my involvement as a costume designer for them over the past few years has been such a significant and large joy in my life. Halloween will always be a huge part of my identity. Anyway, I never could get the girl quite right. I didn't exactly know what I wanted her to look like, other than being a vintage pin up girl. But I started drawing one day, after Martin had told me he thought it would be super amazing if I had a pin up girl. I laughed and asked why, and he said because! It just reflects so much confidence! And it's so you. He'd never been so excited about any of my tattoos before, so this really made me feel motivated to finally get it. I started looking at all my theatre bizarre flyers from years past, photos of the party, and old photos of vintage pin up halloween girls, and then I had it. I took my drawing to Jon Larson, who did my halloween butterfly tattoo and he made this - which was even better than I could have imagined. I decided I wanted to post all of this, because I think there are a lot of people out there who don't understand tattoos. I don't necessarily think this blog post is going to make people feel much different about them, but maybe people who care about me at least will have a more open mind. Society in general today is a lot more open and tolerant of people with tattoos, than it used to be. A girl with a tiny butterfly on her shoulder or a tribal design on her lower back is one thing - but a girl with full sleeves is another. People do look at you differently. I do sometimes fear that now that I am a mom to Alice, that I am being judged. And I'm a really good mom. Actually I'm an amazing mom. It would kill me to think of her being judged in any way because her mom doesn't look like other moms, like when she is older. Sometimes this world is a terribly judgey place. That's hard for me. I even feel sad when I see those websites like "People of Walmart" because I think damn, that's a person inside there. But what I do want to teach her is to not judge people on how they look. Maybe I can set a good example in that way. My parents were bikers and had all these friends that were bikers, and they were not at all like the other parents I knew... and I always secretly loved that. So maybe it will be the same for her. My dad has some tattoos and so do both my sisters. I'm not sure my parents are "happy" exactly that I have so many, but they are for the most part okay with it, I think. And if not I hope this post will help explain it better. 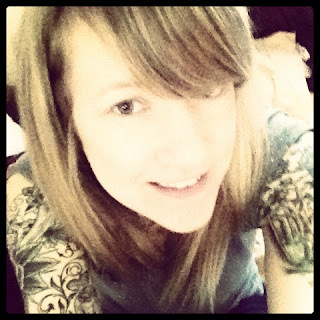 I still have a lot of relatives who have not seen all of my tattoos, and I tend to cover them around people I don't know well - mostly because I'm kind of a shy person and I don't like being stared at. Which many people will say, then why get so many tattoos? People always say that. I guess what is misunderstood is that most people get tattoos for themselves, not for other people. And we don't always want to be stared at, or forced to talk about them. I love mine because they are memories I will never forget. They are beautiful works of art that I can take with me to the grave. Some of them have tremendous weepy memories soaked into them, some of them I can't even talk about without crying - and others I can't talk about without laughing. I love each and every one of them. And what's even better is that I love myself even more now that I have them. I am looking forward to adding much more over the coming years.